Anyone doing archival research will eventually find themselves using archival descriptions. Archival descriptions are embodied in what are often called “finding aids.” They are the archival world’s equivalent to a catalogue entry in a library catalogue. Paper copies of finding aids are often available in the reading rooms of archives. Electronic versions are also commonly available via archival databases (see the end of this post). database). Getting the most out of archival descriptions, however, requires a little basic orientation. Once you learn something about the concepts, terminology, and techniques that archivists use to represent the uniqueness and complexity of archives, you’ll be much better placed to find the material you need using archival descriptions. In this post, we’ll walk you through an archival description by dissecting a portion of an adapted finding aid here at the Peel Archives; however, the vocabulary and tips we’ll pass along will serve you well in using archives in general. 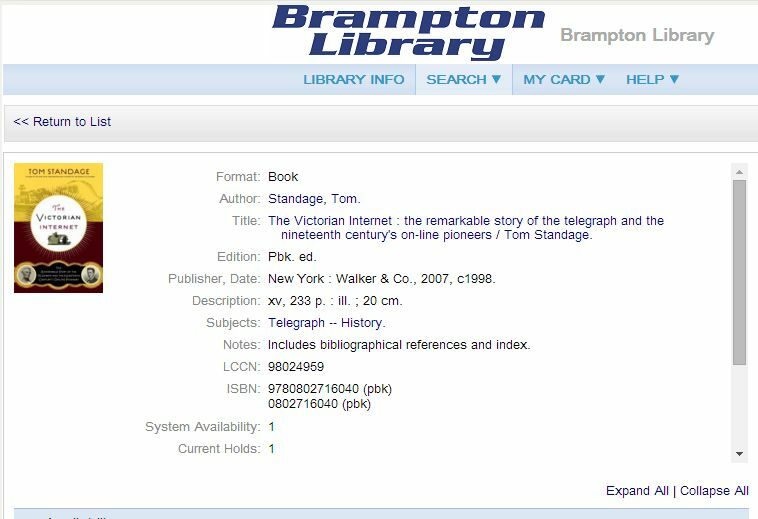 A library catalogue entry is not the same thing as the book it is describing; rather it’s an overview of a book’s most representative features. These include the book’s author, title, publisher, date of publication, number of pages, and whether the book is illustrated. Information like this gives you ways to find the book in the first place (by searching for books, say, by a particular author); it also helps you figure out if the book will be useful or interesting to you. And of course, a library catalogue also helps the library to keep track of their book collections. In a similar way, archival descriptions offer a summary of what researchers can expect of particular archival collections and their components. Archivists use descriptions to keep track of the content of collections, but ultimately descriptions are produced with the researcher in mind. Without these windows on collections, no would know what collections existed or what was in them. Before we look more closely at a description, it’s useful to think about how archival descriptions come to be. Remember that archival records are unique: no group of records is like any other. So when faced with producing a summary of a collection, archivists are beginning from scratch every time. In our post How do Archivists Organize Collections? we looked at how archivists transform accumulations of records into useable collections. Part of this process involves intellectually and physically organizing the materials within the collection to clarify how records were generated or used by the creator of the records whose life they illuminate. To help in all this, the archivist will research the context that led to the creation of the records, including the life and activities of the person or people who produced them. Not surprisingly, during the process of arrangement the archivist will get to know the collection (and, in a way, its creator) intimately. Most archivists will tell you that the process of investigation and exploration is one of the most enjoyable parts of their job; it’s like putting together a puzzle where the picture that emerges is part of someone else’s life. When archivists do background research for their descriptions they draw on interviews with donors (top), published sources, and of course the records themselves. 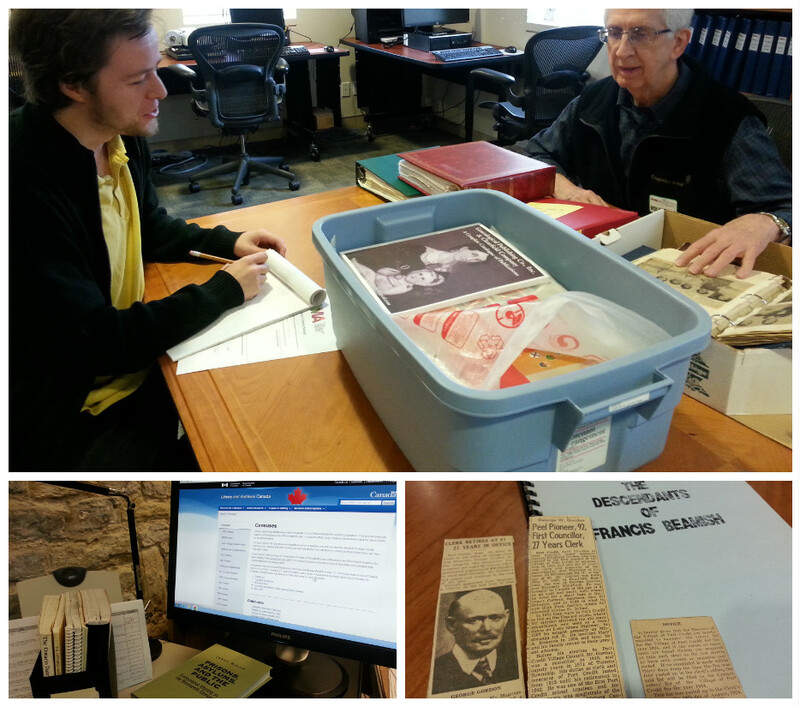 The archivist summarizes her findings and work on the collection in an archival description. The description will be the first point of contact for researchers: it will be their introduction and guide to the collection. The way the archival description is laid out, however, is not up to the whim of individual archivists. Rather, archivists follow recommendations that archival experts have developed over many years. Archivists have developed (and are still developing) standardized ways of characterizing important features of archival collections. Different countries have slightly different descriptive standards and terminologies, but there is a broad international consensus on what it is vital for us to note. 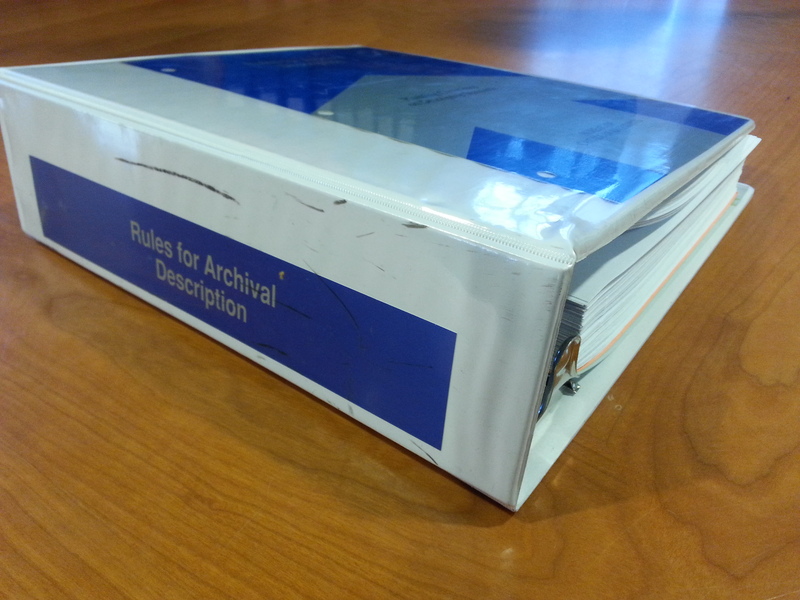 The Canadian Rules for Archival Description (RAD) is a very detailed manual. Canadians can be proud that RAD both predated and also influenced the General International Standard Archival Description (ISAD-G) guidelines. There are many good things about uniform standards. They form a checklist for archivists, to make sure we’ve considered and captured information. They make it easier for different archives to share information. And they make it easier for researchers to quickly grasp the general attributes of collection. But there are challenges for first-time users of archives too. Descriptions of archival collections are generally more complex than library book catalogue entries because archival collections themselves are multilayered and multifaceted. And this means there is some specialized vocabulary to learn. Archival descriptions reflect the hierarchical levels of arrangement that we looked at our arrangement post, so we’ll review those levels again here. We’ve also noted the archival principle of original order: relationships between records should be preserved because they tell us more about the records than do the individual items taken alone. To reflect the internal organization of archival collections (and the life behind them), archivists may further subdivide a fonds into series and subseries, which are groupings based on factors like the function of the records, or other themes or categories. Then, either the fonds (if series aren’t used) or the series themselves will be further subdivided into files. Lastly, files contain items, like individual letters or photographs. Archival descriptions map onto this hierarchy. The fonds-level (or collection-level) description is the most general bird’s-eye view of the collection. That description will let us know if the collection has been subdivided into series; if we want more specific information about the collection, we should drill down to series-level descriptions, and from those to file-level descriptions. It’s very important to note, however, that not all collections are fully described at the series level, and certainly not at the file level. Archivists routinely have to make hard choices about how much descriptive labour to put into a single collection; factors in this decision will include the research value and size of the collection. Sometimes fonds-level descriptions are the only touch-points available to researchers, but within these we try to provide enough information that you can find enough signposts for a range of research topics. Now we’re ready to take a look at a finding aid and its terminology. Just as a library book catalogue entry will routinely note certain information (like title, author, etc. ), archival standards prescribe a number of categories – called elements – that archivists should describe at each level of a collection. Having said that, any archival researcher should remember that formal archival standards are a relatively late invention; this means that not all finding aids you’ll come across (especially earlier ones) will adhere to currently accepted patterns. Also you should expect local variations in archival description. As you scan through this fonds-level description, note the headings which correspond to the descriptive elements, which we’ll discuss next. Let’s go through the elements we can see above. We’re going to think about them in terms of the questions they answer; we’re also going to offer several hints to keep in mind about each. Title: What collection is this? Titles are often applied to collections by archivists since not many people apply a formal title to their own body of records. You should be aware, however, that where titles are supplied by the creator, they might not be as descriptive as we would ideally like. This applies especially to file titles – think about what you may have named some of your own personal files in the past! Still, the archivist will preserve the creator’s file titles if it helps preserve that creator’s thought processes. Ideally the archivist will note the source of the title. 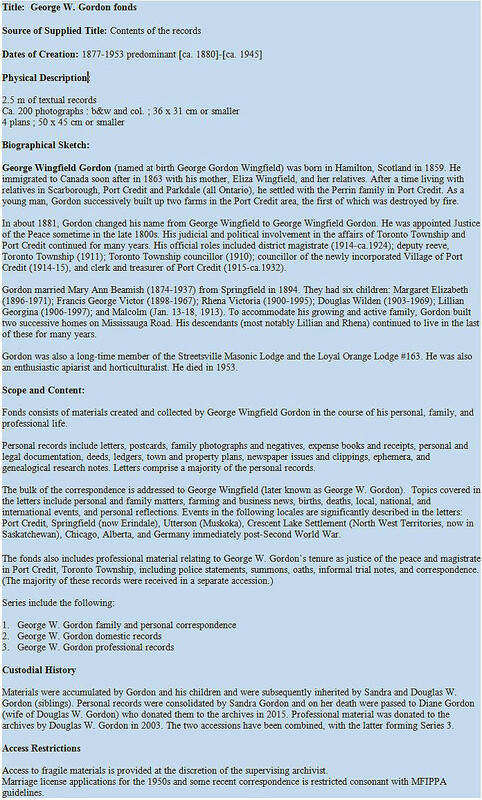 In the case of the Gordon fonds, the title tells us that the records relate to George W. Gorden’s activities. We also know that we’re looking at a fonds-level description. Dates of Creation: When were the records produced? The dates noted by the archivist tell us the time span covered by the records within the fonds (or series, or file). The dates apply to the creation of the individual records themselves, and not when they were procured by the creator of the whole fonds. It’s therefore perfectly possible for records to be earlier than the life of the creator of the fonds. For example, a person’s fonds may contain letters written before he was born, which he inherited or collected. Date ranges are rarely inclusive (i.e. there won’t necessarily be material from every year in a given range). If the coverage is fragmentary, the archivist may indicate outliers separately by inserting commas between dates or she may indicate that most of the records lie within (are predominant) in a smaller range. Dating historical records can often be a matter of guesswork. Ideally the archivist will attempt an approximation, which is indicated by square brackets or a circa (ca.) date. We can tell that the majority of the records in the Gordon fonds are dated between approximately 1880 and 1945. Physical Description (or Extent): How much material is there and in what form? 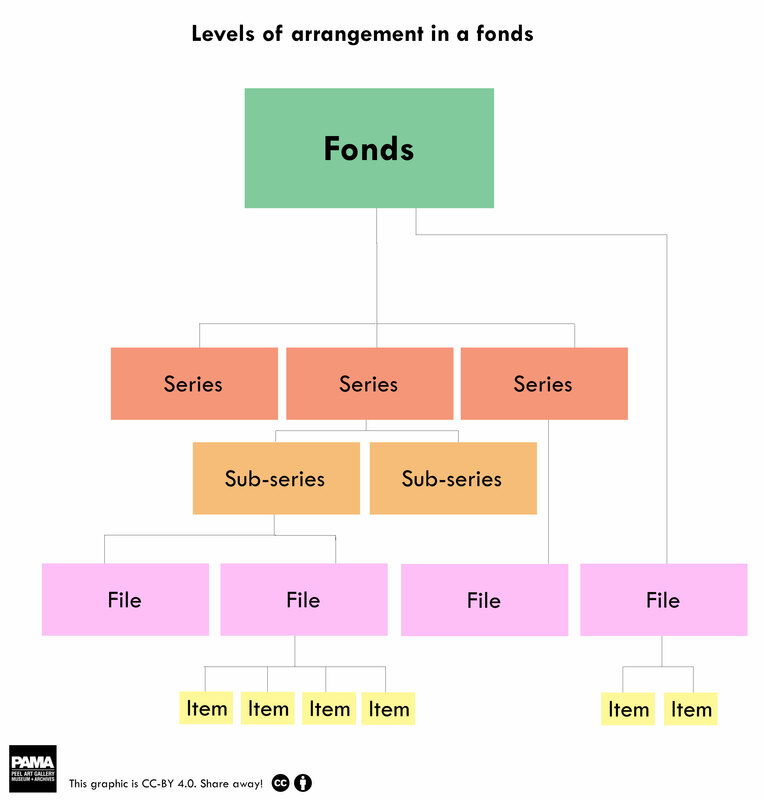 The physical description or extent of a fonds (or series or file within it) tells you the amount of material involved. This will help you with such practical matters as time management: material that takes up a metre of shelf space will take longer to peruse than one that occupies a single file folder. This element may also tell you how much of the archival material is found on certain media (such as photographs, textual documents, or maps) with certain attributes. Various media may need to be handled differently, and may be stored in separate areas of the archives. Different institutions and different countries use various ways of characterizing amounts of records. Some give a box count. Because boxes can vary in size, many archives instead note the linear shelf space that the collection occupies (in metres or feet). The level of detail in this section may vary; archivists will, for instance, not always count the number of photographs. 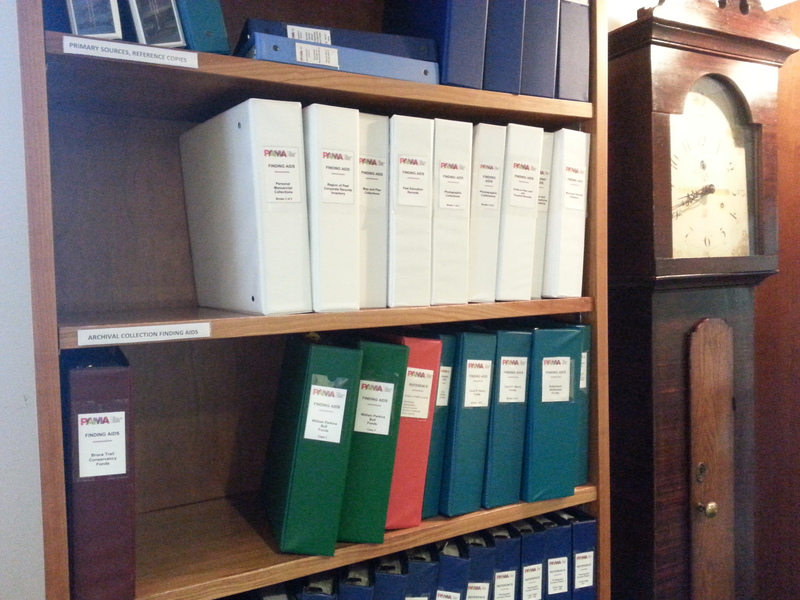 We can tell that the Gordon fonds takes up almost three metres of shelving. Its series-level descriptions (not shown) would help us to zero in on smaller amounts of material to investigate. Biographical Sketch or Administrative History: Whose records were these and what did they do? Don’t necessarily count on an exhaustive account of the life of a person or organization. The aim of the archivist is to illuminate the records in her care; her biographical sketch will focus on the creator’s activities that relate to the records. Sometimes little or nothing is known about a creator, especially if material comes to us with little known provenance. You’ll only see this element in fonds-level descriptions. A variety of biographical sources on Gordon was available thanks to his role in the community. Think about how our knowledge of his occupations (e.g. as a magistrate) might reflect on our view of his records (e.g. his informal notes on civil and criminal trials). Scope and content: What can the records tell us, and how? The scope and content section gives an overview of the types of documentation in the collection, as well as its actual content. It’s the real meat of the finding aid. Usually the archivist will note the range of formats covered by the documentation, such as letters, minute books, newspaper clippings, expense accounts, photographs, or any of the other myriad ways people record information. She will also indicate the breadth of topics, events, and dealings documented by the records and relate them to the activities of the records’ creators. Archival collections can be very large and contain thousands of individual items. Because archivists very rarely list every item in a collection, and can’t anticipate every research need, you’ll need to think creatively in order to find material on a particular topic. Again, some Scope and Content sections will be more comprehensive than others due to the labour allocated to them by the archivist. The Gordon Scope and Content note suggests the fonds contains detailed letters describing conditions in Germany after its surrender in 1945. So this fonds of a small-town Ontario farmer and magistrate might be a great source for eyewitness accounts of what life was like for Germans at that chaotic time. Custodial history: Where and with whom have the records been since their creation? Custodial history is an account of where the records have been since they were created. The route records took in the world before they finally arrived in the archives can affect our view of them. Archivists and researchers are concerned about the authenticity and integrity of records. We like to know that the material we’re looking at really is what it seems to be; we’d also like to know if the material might have been changed, rearranged, marked up, or annotated over time. Records that have passed through numerous hands are more likely to have become fragmented or incurred changes. Records that come straight from the person or organization who created them are more likely to display informative original order. Access Restrictions: Can I view this material? Occasionally archivists restrict certain materials for various reasons, including concerns about the privacy of people represented in records, or about the physical fragility of the material. Restrictions are usually mitigated by keeping them in place for a limited time period or by providing copies (of fragile documents). Repository: What archives holds this material? If you’re looking at a finding aid in an institution’s (“repository’s”) reading room, or on its website, you probably won’t see this heading. But you should be aware that there are both web and print sources that aggregate archival collections based on a geographical location or a topic. In that case, you’ll want to make sure you know where a collection is physically held. Reference Code or Call Number: How does the institution refer to this collection? Not every archives uses this heading, but if they do you’ll need to note this number – it’s the way you’ll let them know which collection you’d like to use. We hope these basics will help you to navigate the wide archival world out there. To show in a small way just how wide that world is, we’ll finish this post with a sampling of descriptions drawn from online resources from the top three countries represented by our blog readers: Canada, the US, and the UK. You can use these screen shots (or, even better, the links to the live description) to practice finding the information we’ve described above – or just marvel at the gamut of human experience captured by archives. Yes, we think reading finding aids is fun, even if you can’t travel to view the unique records they point to. We’ll close with a word on searchable online archival databases and catalogues such as some of those we’re mining below. Many archives caution that only a fraction of their total holdings are represented among their online descriptions. Setting up and populating an online archival database is an intricate enterprise, made especially challenging by the complexity of (and variation in) archival descriptions over the years. The Peel Archives, in consultation with the Region of Peel, is currently exploring options for bringing this service to you. In the meantime, remember that archivists themselves are, and always will be, your best guides to the collections they care for! Click on the image to enlarge, or check out the collection on the website of the institution. Note that in some cases the links to the levels of description shown were not stable, so you’ll need to search for the collection and navigate to that level yourself. Who knows what you might find as you dig around! 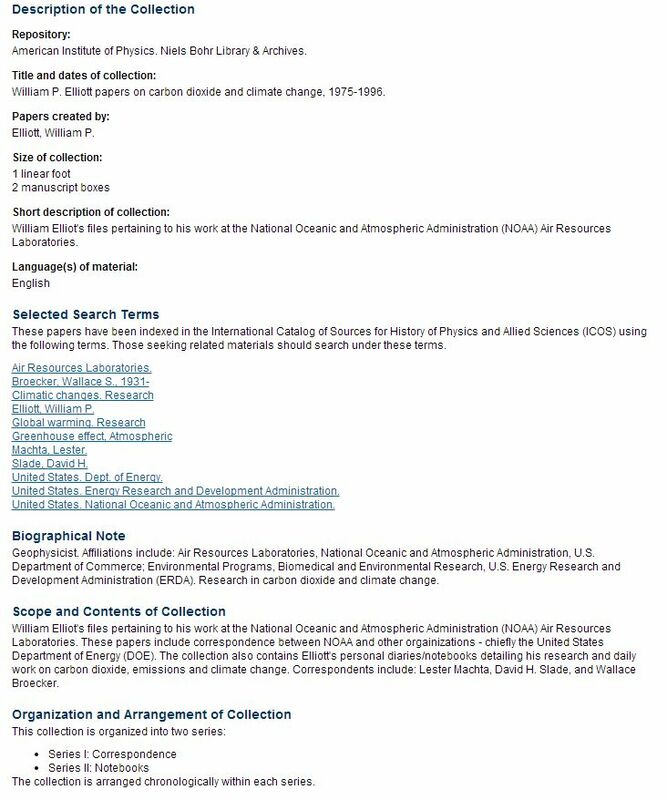 Fonds-level description of the William P. Elliott papers on carbon dioxide and climate change at the Niels Bohr Library & Archives, American Institute of Physics. 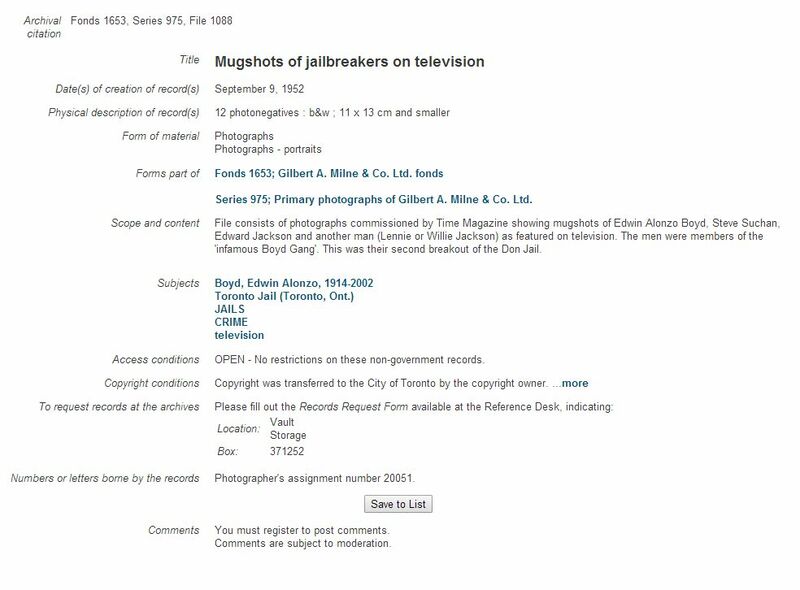 File-level description of the Gilbert A. Milne & Co. fonds at the City of Toronto Archives. 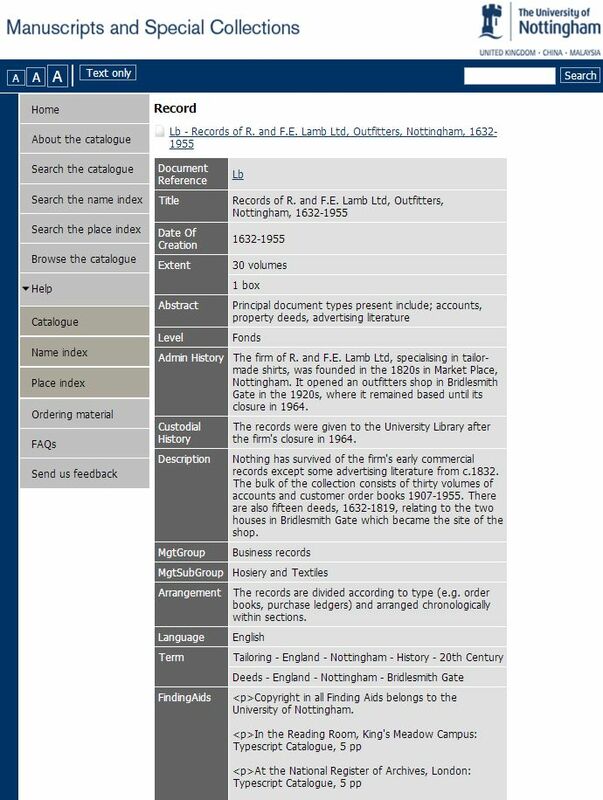 Fonds-level description of Records of R. and F. E. Lamb Ltd., Outfitters at the University of Nottingham Manuscripts and Special Collections. Series-level description of the Charles Augustus Strong Papers at the Rockefeller Archive Centre. 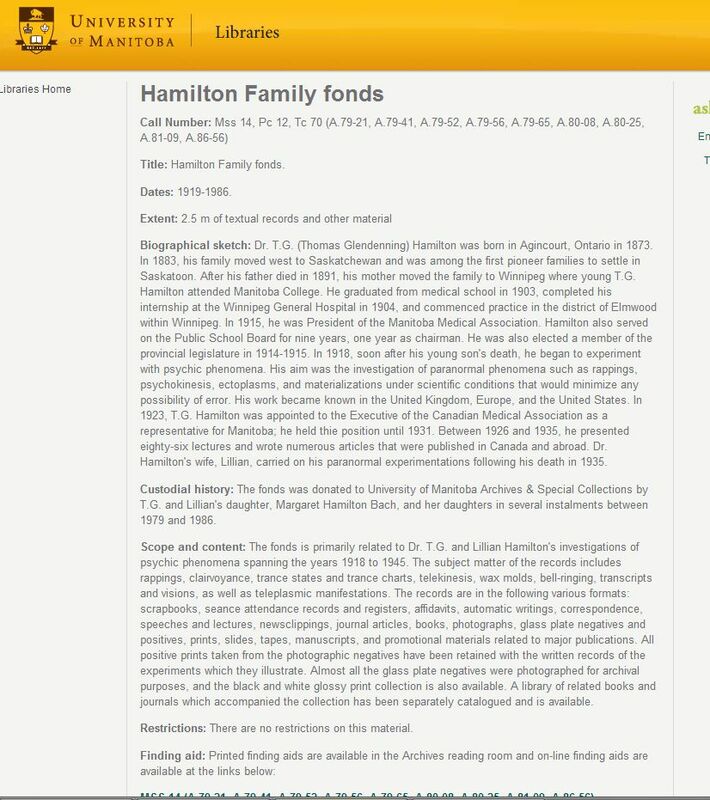 Fonds-level description of the Hamilton family fonds at the University of Manitoba, Archives & Special Collections. 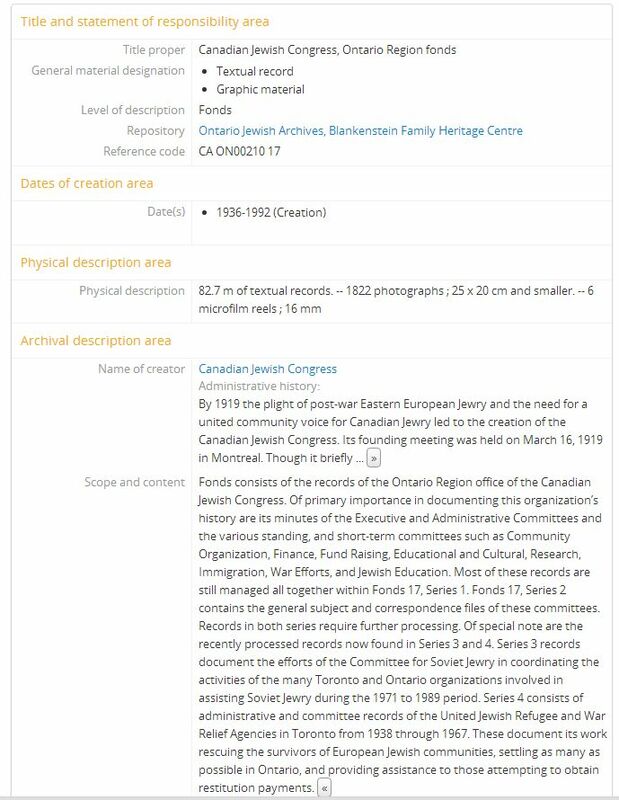 Fonds-level description of the Canadian Jewish Congress, Ontario Region fonds at the Ontario Jewish Archives, via Archeion. Fonds-level description of the African American Mennonite Association Records, the Mennonite Church USA Archives via Mennonite Archival Commons.